I have such a hard time committing to series books, but when I heard that The Outliers was 1) written by the wildly talented Kimberly McCreight and 2) that this one had already been optioned for film by Reese Witherspoon’s team…well, who could resist? Just like Julie Buxbaum who joined us last week, Kimberly also took the plunge into the YA genre for the first time in this highly anticipated trilogy. I am so excited to share a little bit behind this creative idea that Kimberly has created for her storyline. FYI- I received an ARC of this book- all thoughts and opinions are my own. Grab your coffee and let’s settle in for a chat with Kimberly this morning! I was so surprised to see that you have started publishing in the YA genre after years writing in Women’s Fiction. In an interview you stated that the “boundaries between Adult and YA are more fluid than ever before,” making it an easier transition for you as a writer. Do you think this fluidity between genres creates more adult readers to your books or do you just think that YA books are just becoming more and more adult in language & nature, helping bridge the gap between the two? I think wonderful books are wonderful books whether classified as YA or adult. That’s always been true. But if adults might have once hesitated in picking up a YA title for themselves, that has certainly changed. The majority of those who purchase Young Adult books are adults buying for themselves. Also I think the lines between all genres are becoming increasingly blurred as writers experiment and readers become more flexible in their expectations—there are literary novels that are sci-fi and historical, mysteries that are women’s fiction and also literary. The Outliers is the first book in a planned trilogy that you are developing. How did you come up with this creative concept to explore emotional intelligence in this way? The Outliers was inspired by my daughter who has always been preternaturally empathetic. This has genuine advantages—it helps her move more easily through tricky social situations and deepens her friendships. But it can also be a burden, causing her to be on the anxious side. And these are qualities we share—for better and for worse—as do most of my closest female friends. It was in pondering this connection between my daughter and I that I came to consider a connection between emotional intelligence and anxiety, particularly in women. It was in this “what if” that the seed for the trilogy was planted. I noticed that you thanked many doctors in the acknowledgements of your book. What type of doctors did you consult in the development of this story and how did they help you round out your book? Did they find this idea of women utilizing emotional intuitiveness as a power plausible with the fictional research you created for Wylie’s dad? Some of the doctors were Emotional Intelligence researchers, some were neuroscientists and others were simply professors whom I consulted about life as a researcher. Each was enormously helpful even if it was just in getting me the name of someone else might be able to answer my questions. With regard to the specifics of the EQ/Intuition issues, responses ranged between rejecting the proposition outright, to pointing out potential limitations in my hypothesis. But there was one well-known researcher who called my idea intriguing. And, yes, it was a thrill. However, to be clear, the book is fiction. It not an accurate representation of the state of the research. That’s not what I was trying to do. I was speculating about a set of facts hasn’t been proven—but maybe hasn’t been categorically disproven yet either. Results are always influenced by the way a study is conducted and the book proposes something discovered because unexpectedly because something else is tested in a new way. That is how many discoveries are actually made: accidentally. If I was tested for emotional intelligence I REALLY feel that I would be an outlier too. I carry around the weight of everyone, I’m extremely empathetic (sometimes to the compromise of my own emotional health), and I am high anxiety. Basically, I’m probably a toned down version of Wylie. Are you empathic, anxious, & attuned to others too? Do you think this is something that many teen girls struggle with? First, you and I should totally hang out because I am definitely an Outlier too! We’d probably be BFF’s. And there’s no doubt that teenage girls struggle with anxiety at a much higher rate than boys—the statistics show that. This gender disparity persists into adulthood. However, the jury is out on the cause of this difference—socialization, hormones, or brain chemistry are all possibilities. There is also research to suggest that girls are better at reading facial expressions of emotions. Do I personally believe that there is a connection between anxiety and gender and intuition? Yes, definitely. But that’s where the scientific aspect of my book ends and the speculation—and fiction—begins. source: Reese Witherspoon’s IG feed! It was announced that we can expect to see this book, The Outliers, in theaters now that it has been optioned for film by Lionsgate with Mandeville and will be produced by Reese Witherspoon’s production team, Pacific Standard. How did you find out this news and about Reese’s love for your book? Will you be involved in the writing of the screenplay? I could not be more thrilled to be partnering with Lionsgate, Mandeville and the incredible Reese Witherspoon and Pacific Standard. The book was optioned fairly early in the process and they have been amazingly supportive and enthusiastic throughout. I won’t be writing the screenplay, as I’ve got the next two books in the trilogy to focus on, but I have felt wonderfully included in the process. Mostly, I sit around daydreaming about getting to sit in the audience. As a writer, you also have the unique insight on how this book to movie idea works since, Reconstructing Amelia, will also be made into a film. Is it exciting seeing your book to life? Nerve-wracking? How you picture it? It is absolutely thrilling to think of both Reconstructing Amelia and The Outliers being brought to life on the screen. When I’m writing, the stories play out in front of me like a movie so I am especially delighted to think of sharing that visual experience with others. Filming has not yet begun on Reconstructing Amelia so I can’t speak to the specifics of how that will feel, but I don’t feel nervous in the least. Working with such amazing artists and studios—Nicole Kidman, Blossom Films and HBO for Reconstructing Amelia and Lionsgate, Mandeville, Reese Witherspoon and Pacific Standard with The Outliers. I have no doubt they will do a superb job in bringing the stories to the screen. You had a long journey into publishing starting with a completely different career path as a lawyer. I understand that Reconstructing Amelia was the 5th manuscript you had turned in before you finally reached your goal as a published author. Do you have any words of encouragement for writers that are struggling to see their first book on the shelves? What helped you not give up on this dream? I was lucky enough to get some encouraging rejections early on, which I held on to as I kept working. It’s important for writers struggling to get where they want to be—whether that’s finishing a book, or seeing it on a store shelf—to know that both the process of writing and getting published are both really, really hard. Almost all successful authors have faced an enormous amount of rejection—and I mean usually in the order of five rejected books, decades of writing, hundreds of discarded stories. The key is to recognize that writing is a craft that we all get better with more practice. True salvation lies in focusing on the work in front of you, and the next idea tumbling around your brain. You wrote this book as a warning to your daughters about how the world they grow up in may include people who deem them unworthy. You wanted to remind them they are powerful enough to rise above it and to help them to trust their instincts. Why do you think these messages are so important today for teens and why do you think so many of us struggle in the face of it all to trust our instincts? It’s important for everyone to learn to trust their instincts. But I do think it’s especially important for girls. We’ve made incredible strides toward equality. It can be easy to think we have arrived at our destination. But in many troubling and fundamental respects women continue to be regarded as less than men. And I do think that women and girls are more often encouraged to doubt their own instincts. Can you name a time, when you were a teen, that you didn’t trust your intuition and wish you would have? As a teen, I was exceptionally good at following my instincts. But I can give you an example from just a few weeks ago on vacation when I didn’t follow my instincts. We were snorkeling and the boat started to have trouble near shore while others were disembarking. I had the very strong sense that we should get off then—even though it would mean taking a cab back to our hotel. But I didn’t insist and when the boat ran aground moments later and the motor was killed, I was absolutely kicking myself for not having gone with my gut. In the end my husband, two children and myself all had to literally abandon ship and swim—in life vests—through pretty big waves until we reached the beach. The truth is, even as an adult, it’s easy to doubt your instincts. 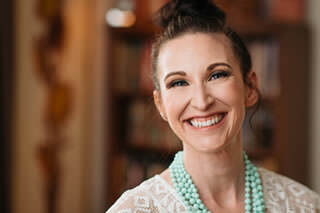 You can connect with Kimberly McCreight on her website and on Facebook! I’m always thankful for these moments with writers and I hope you will pick up this amazing book! You can always connect with me on GoodReads, through our books section of our site, and you can read our entire Sundays With Writers series for more author profiles. Happy reading, friends!